You may just want to elope, get married quickly for various reasons. Still there is so much emotion involved and as a wedding planner I understand this fully. Just because its just the 2 of you eloping to Cyprus; your wedding is just as special as any grand affair. 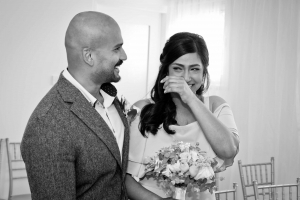 I love this photo of Sheetal, she got very emotional whilst saying her vows at her wedding to Shijin at Paphos Town Hall. In the past few years, a large proportion of my clientele has consisted of international couples living and working in countries like Dubai, Qatar and many more in the Middle East. As you may know, when getting married sourcing the correct documentation needed to get married can be a bit of a headache, especially for foreigners living in UAE countries. 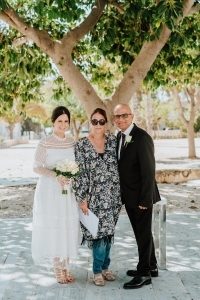 However Cyprus, it is easy to arrange civil weddings that are legal as well as making sure that your wedding certificates are authenticated so they are recognised in your country of residence. I have arranged hundreds of weddings for clients from countries all over the world, but that are based in the UAE. Normally, when couples contact me they often feel rather stressed about the bureaucratic formalities of arranging a civil wedding. My job as a wedding planner is to make the procedure as stress-free as possible so that couples can relax as enjoy their day without having to worry about all the little details. In addition, geographically speaking, Cyprus is aptly located between the Middle East and the entirety of Europe, being one of the major draws for international couples based in the UAE to get married there. For international couples that have family traveling from far and wide, the island serves as a place somewhere in between. Not to mention its Mediterranean climate, phenomenal sunsets and scenic vistas. Depending on the couple and their needs and desires, I am able to arrange simple civil weddings where the couples want to elope or those for larger parties with a formal wedding reception dinner. Some of my clients prefer to have their wedding party once they get back home; they just need to get the formalities out of the way. It is sometimes necessary that they marry urgently and this is possible as long as they have the correct documentation ready to go. Beyond the paperwork, I am involved in arranging any extras that you might want on your special day, such as bridal hair and makeup, a bridal bouquet, flowers, a wedding cake, a photographer, reception dinners, DJ, and much more. So if you’re wanting to get married in Cyprus, but don’t know where to start I will walk you through the process, step by step, so you can anticipate your special day with ease!